Carsifarm® is used in case of: Toxic liver damages due to diabetes mellitus, drug addiction, chemical abuse, chemotherapy, professional intoxications in persons, engaged in chemical industry, galvanizing plants, Nuclear Power Plants workers; Acute and chronic hepatitis, liver dystrophy and cirrhosis, chronic cholecystitis, biliary dyskinesia, pancreatitises; Lipid metabolism disorders. 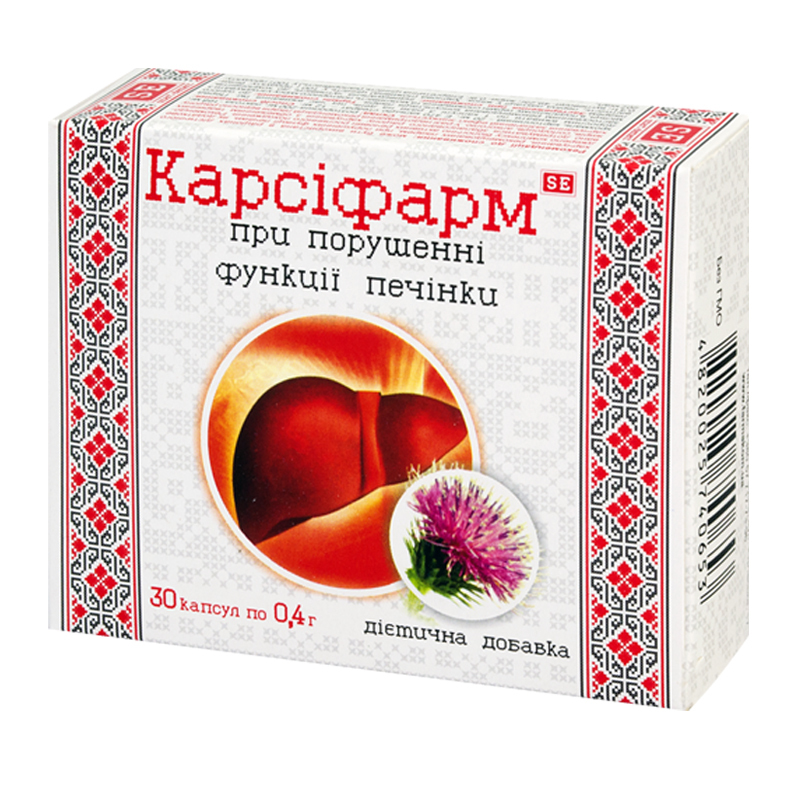 Milk thistle (silybum marianum) – 200 mg. Milk thistle (silybum marianum) is a medicinal plant, which has been used for many years to treat liver diseases. Active ingredient of silybum marianum is a rare biologically active substance – silymarin; in addition, it also contains such microelements as zinc, copper, selenium, the whole range of fat-soluble vitamins, quercetin, polyunsaturated fatty acids, some amino acids, flavonolignans – about 200 biochemical components in total, what predetermines its multiple applications. Silymarin (a complex of flavonolignans – sylibinin etc.) has expressed hepatoprotective and regenerative effect on hepatic cells, provides antioxidative, detoxifying action (neutralizes toxins and poisons). Silymarin prevents penetration of toxic agents to hepatic cells and degrades other poisons before they begin affecting them adversely. This is the only known natural compound, protecting hepatic cells and restoring liver function, as of today. Adults take 1 capsule thrice a day with food for one month, further the term of use and the possibility of retreatment are to be agreed with a doctor. Proteins – 0.41 g, carbohydrates – 49.25 g, fats – 0.9 g.